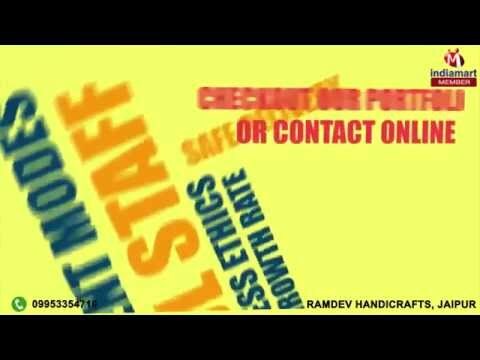 Welcome to Ramdev Handicrafts, established in the year 2004, we are manufacturers, suppliers and exporters of Home Furnishing Items. The offered range is made up of the finest Decorative Bed Sheets, Cushion Cover and Designer Hand Bags, having a high preference in the market. Making of this range is done as per the set industry norms and guidelines, utilizing the finest materials and modern machines. This ensures the products fine finishing and highly attractive design. In addition to this, the offered range is quite reasonably priced. The highly developed state-of-the-art infrastructural facility at Ramdev Handicrafts, has been parted into several highly operational units, in order to attain smoother and effective management of the firms operations. Further, the industry ethics we abide by helps us in generating a huge client base, comprising reputed names like Shah export, Om Shage and Malni Impex.